How would you design your dream kitchen? 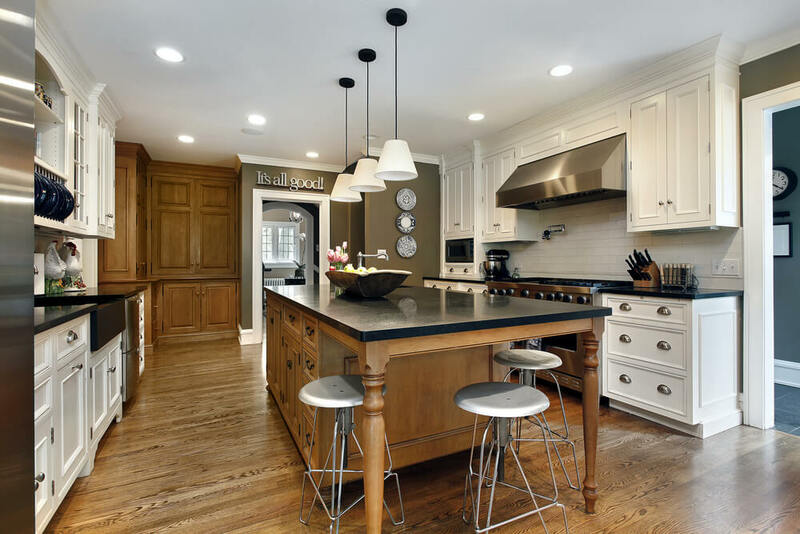 Does it include white, Shaker-style cabinetry or dramatic, modern cabinetry painted a deep gray? How would you design your dream kitchen? 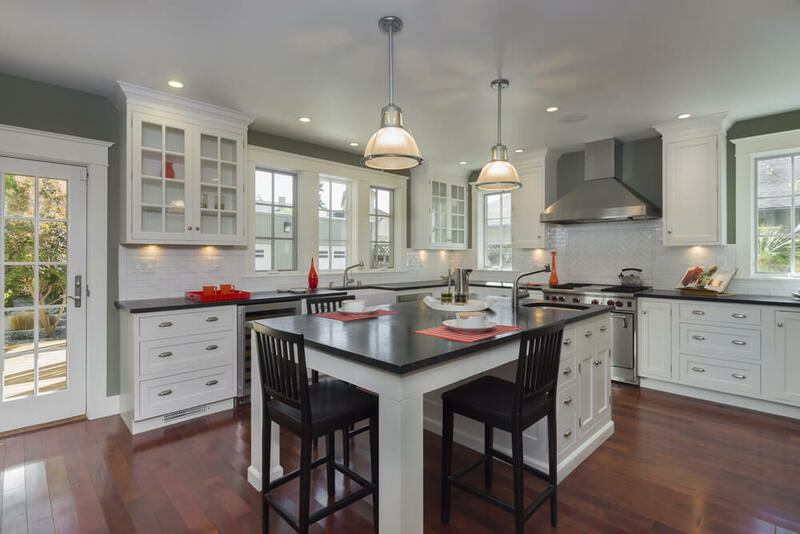 Does it include white, Shaker-style cabinetry or dramatic, modern cabinetry painted a deep gray? There are endless decisions to make when it comes to planning a dream kitchen. 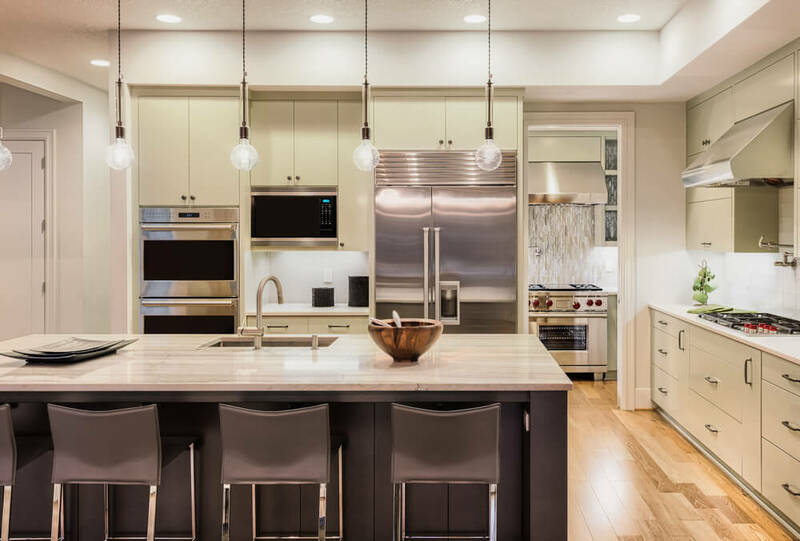 Moreover, unless you are employed in the industry as an interior designer or kitchen contractor, you will likely need to seek out professionals to help make your dream a reality. 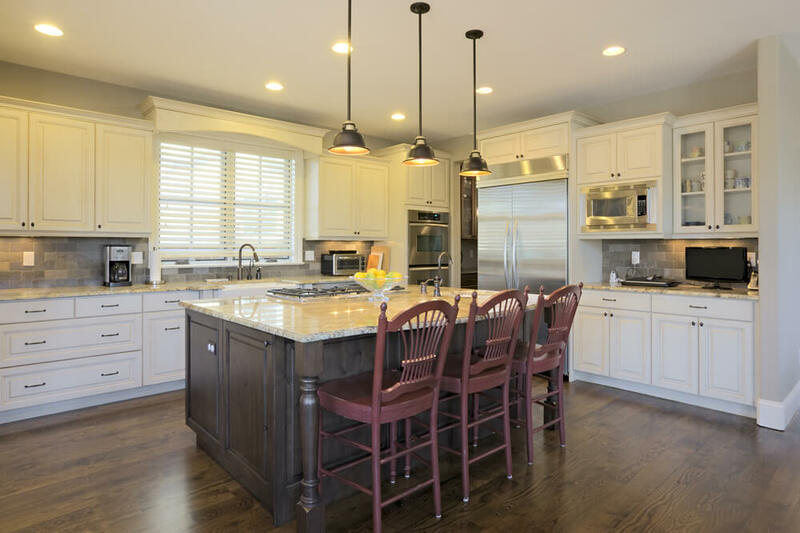 While Shaker-style cabinetry has a timeless appeal, it has been even more popular as of late. This classic door style is simple, yet elegant. 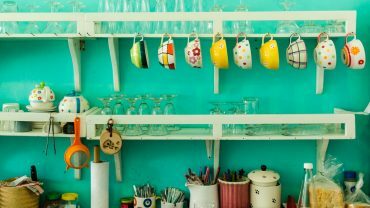 Its adaptable style makes it ideal for a variety of kitchen designs, from traditional to eclectic. 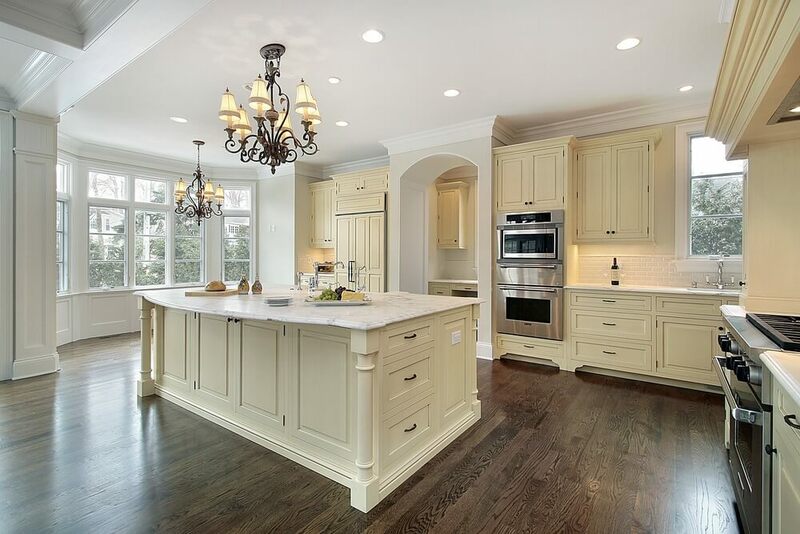 Many homeowners have been opting for open shelving in place of classic, upper cabinetry. 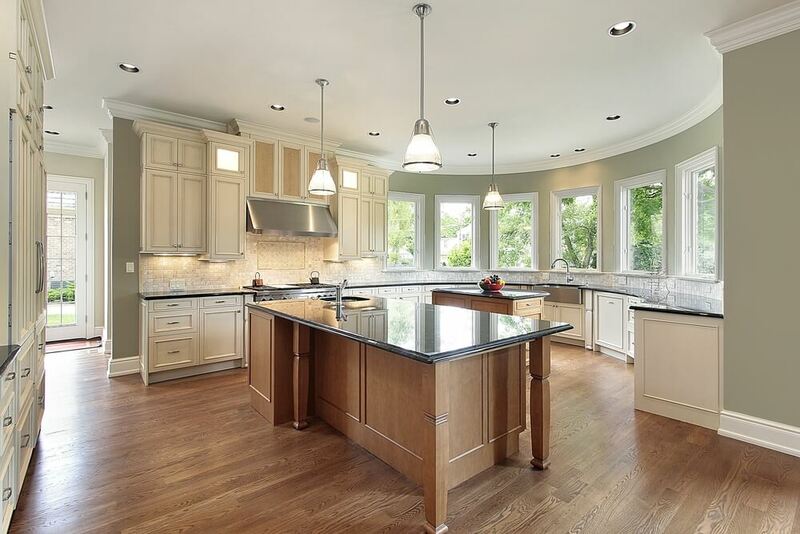 This can be ideal for those who wish their dream kitchen to appear open and airy. The use of open shelving reduces the visual weight of a kitchen, creating a modern appeal. Tile is always popular in kitchens, from flooring to backsplash because it makes for easy cleanup and adds a sense of luxury. In addition to the installation of open shelving, kitchens have also been incorporating large sections of tile. This style involves installing tile from countertop to ceiling on an open wall in the kitchen. Subway tile is always a favorite for this type of detail as it is cost effective and transitional. Applying a dark grout against white Subway tile can add a graphic detail to any kitchen. A kitchen island often acts as a focal point for the space. 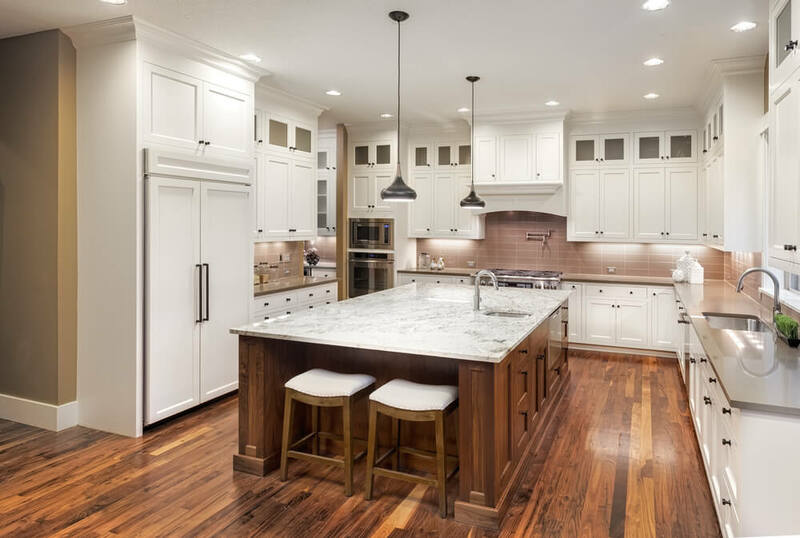 Because of this it is important to choose an island that fits appropriately in the space while reflecting the design of the surrounding cabinetry. Details such as paneling, furniture legs and a waterfall countertop installation can really make a kitchen island stand out. Another option is to paint it a contrasting color; for example, a dark gray island in an all-white kitchen. In the past kitchens have featured hardware with similar finishes to make the space cohesive and pulled together. However, this practice has changed in recent years to favor a more eclectic selection of hardware. For example, while the cabinetry hardware may stay the same, the faucet could be installed in different, yet coordinating finish. 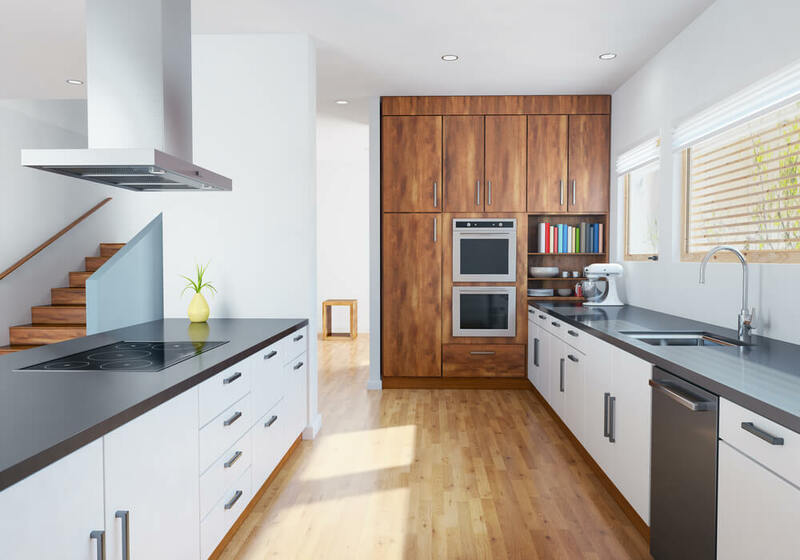 With all the options out there, it can be difficult to make that final decision for your dream kitchen. Take time to choose elements that reflect your personal design style. In addition, listen to the advice of your kitchen professional, they are there to make the process easier for you. 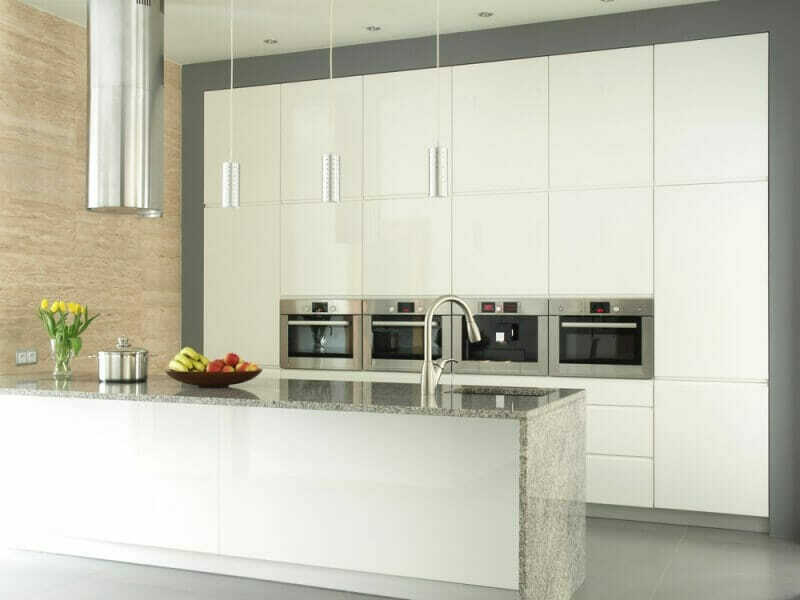 A clear design plan implemented by experienced professionals will ensure that your kitchen is both beautiful and functional. 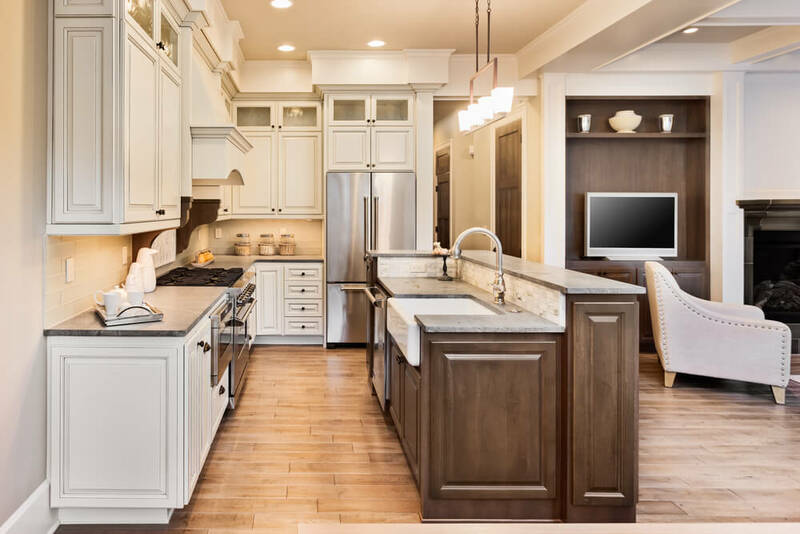 This kitchen is designed for multiple cooks as it contains a full range towards the back of the kitchen, through the doorway, as well as an additional cooktop and pot filler. 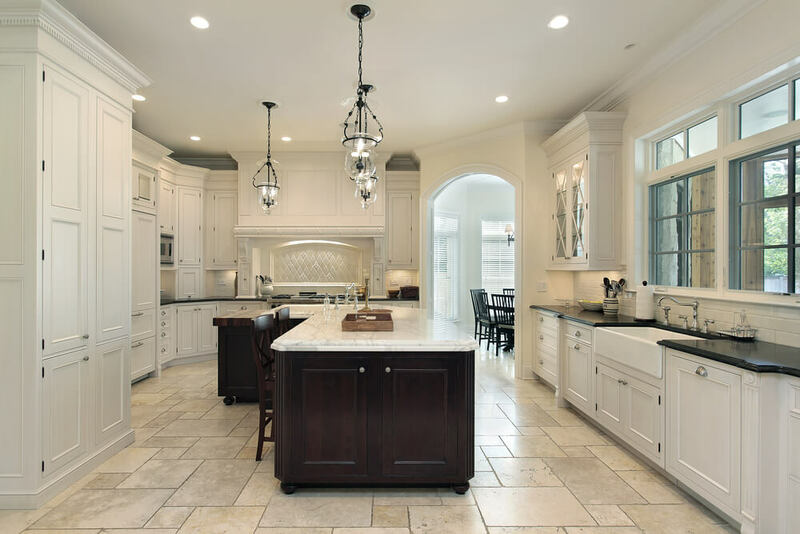 The spacious island features a solid stone countertop and is accented by a set of 5 simple bulb pendants. 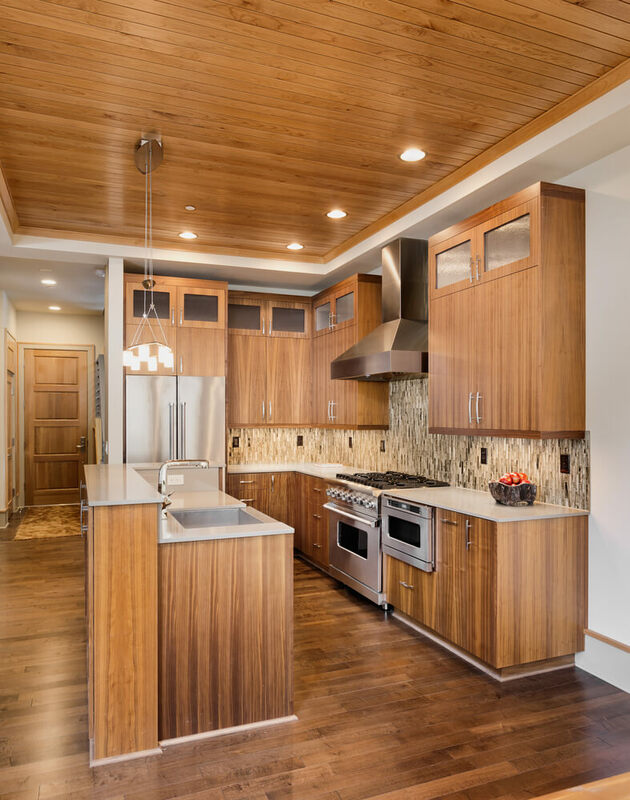 This kitchen is filled with warm wood tones, from the hardwood flooring to the paneled ceiling detail. A bi-level island features an undermount sink for prep work and kitchen clean up. 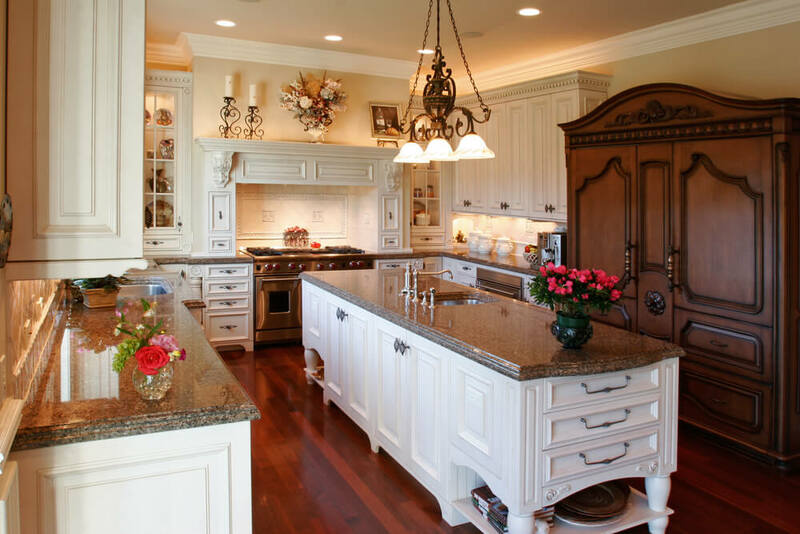 This elegant kitchen features a large island with space for four to sit comfortably. The kitchen cabinets provide a rustic design element accented by a textural stone backsplash. This kitchen features crisp white cabinetry and a contrasting black countertop. The subway tile backsplash is installed in a herringbone pattern above the kitchen range. 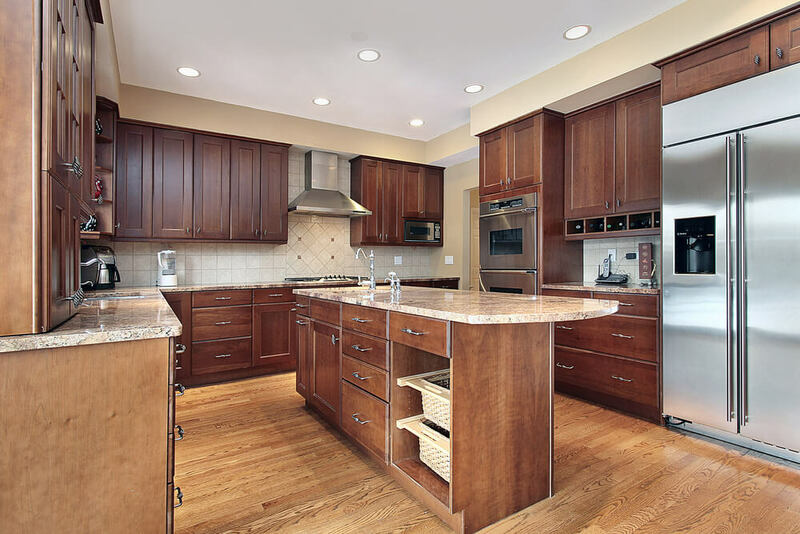 This kitchen features warm hardwood flooring and a bi-level island. The Shaker-style cabinetry features a custom range alcove where the rangehood is hidden behind cabinetry of the same style. This kitchen features an “L” shape design with island addition. It is designed to offer long runs of counterspace that make kitchen prep and cleanup a breeze. This kitchen features rich, espresso-colored cabinetry accented by a tumbled stone backsplash. 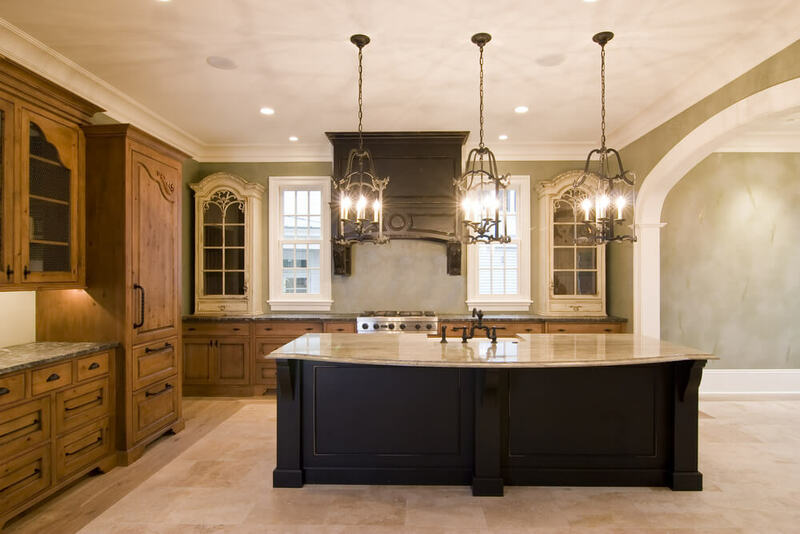 Two mini chandeliers, located above the island, provide an elegant source of task lighting. 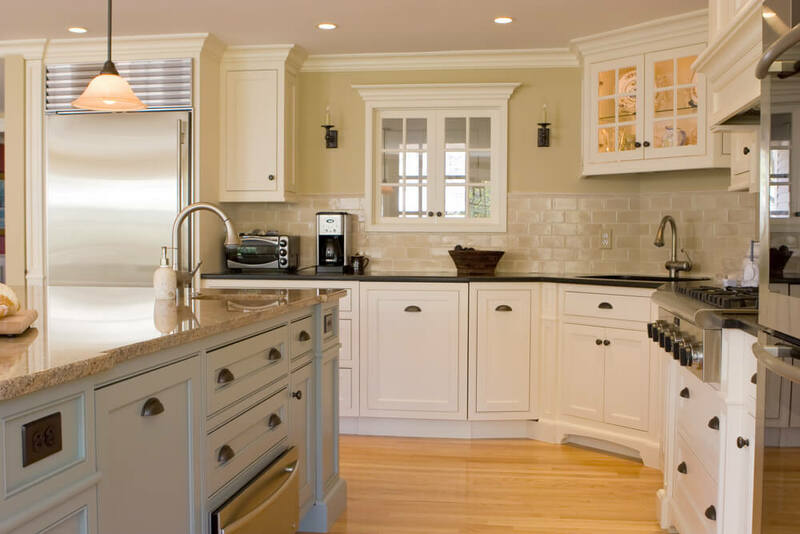 This beautiful space features black cup pulls and knobs set against crisp, white cabinetry. The light blue island contains a small sink and built-in dishwasher, as well as a solid stone countertop. 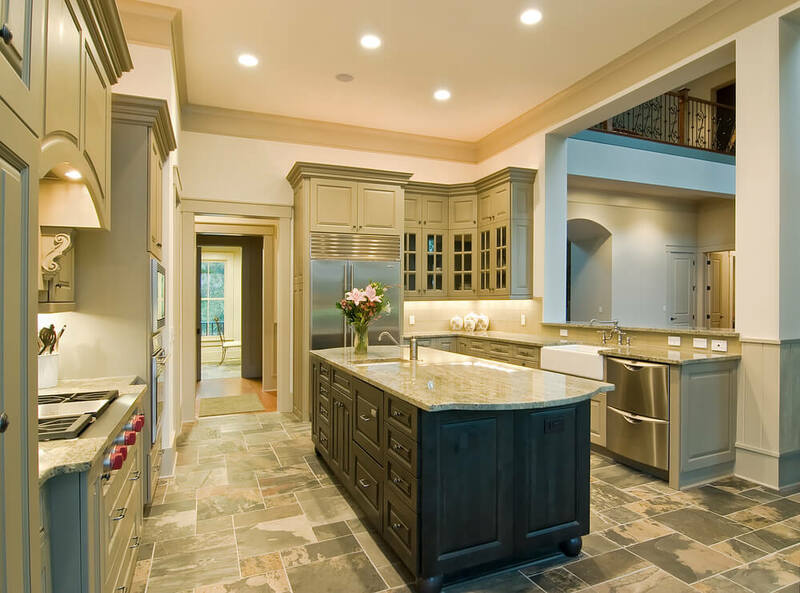 This spacious kitchen incorporates a variety of finishes to create a custom look. 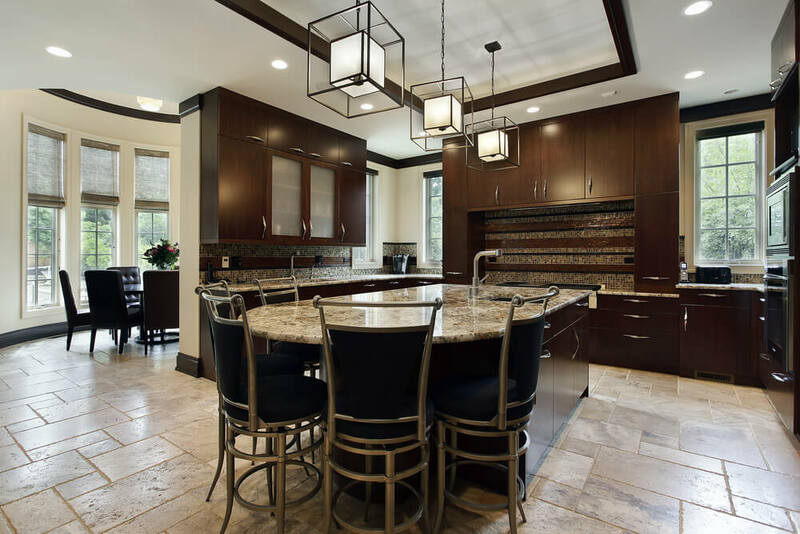 The dark finish of the expansive island reflects the rangehood installed on the far wall. This kitchen is designed with convenience in mind. Large sections of counterspace, two sinks, a pot filler and a large island provide the ideal space for cooking and entertaining. This focal point of this kitchen is the large island with built-in wine fridge and farmhouse sink. Three matching globe pendants are an additional light source and appear to float above the island. The stone floor provides a subtle color scheme for this elegant space. A custom range hood accented by corbels and a inset tile backsplash provides a beautiful focal point. This spacious yellow kitchen is a cook’s dream. 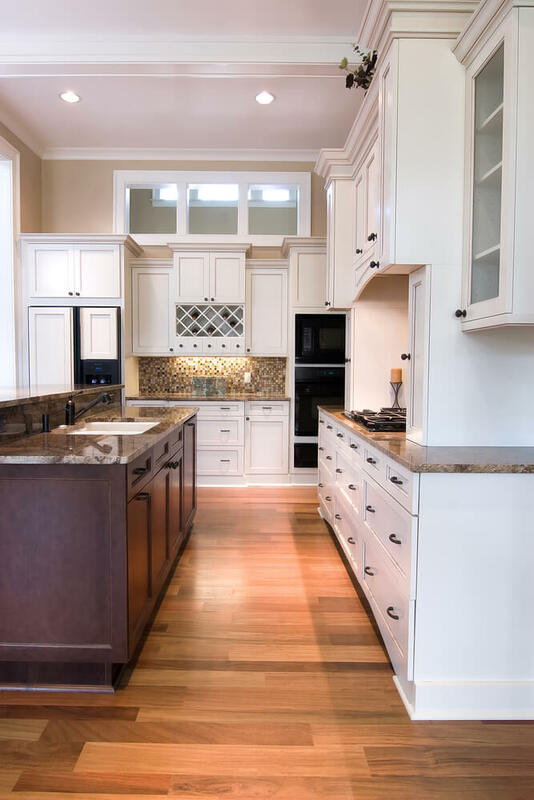 With ample cabinetry and a large island, this space provides plenty of storage and counter space to make preparing a meal easy. While decidedly modern, this L-shaped kitchen features a few interesting touches such as the kid-sized table and unique, raised fireplace. 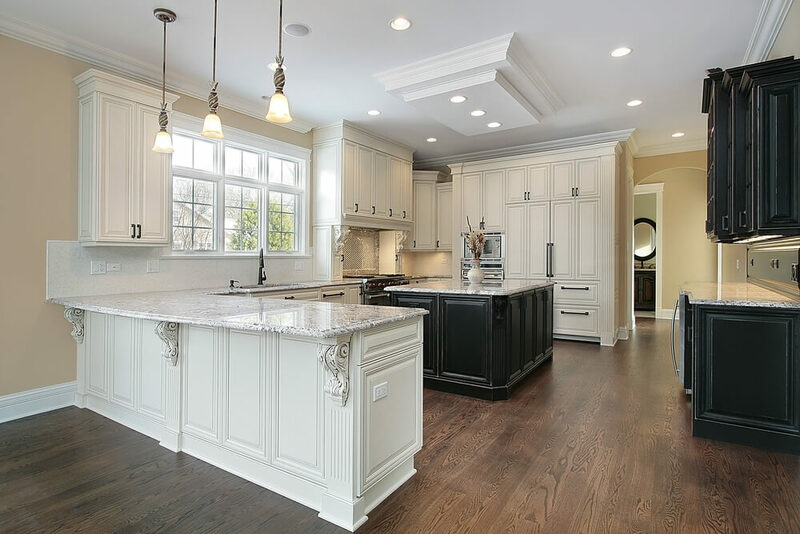 This dramatic kitchen features a combination of white and black cabinetry accented by decorative elements such as corbels and furniture toe kicks. The large window section, located above the sink, provides a view of the outdoors and fills the space with lots of natural light. 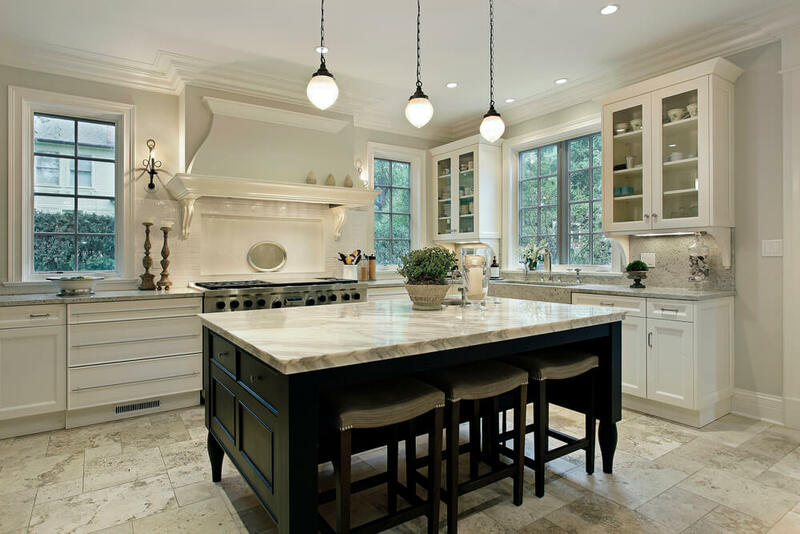 This kitchen features a large, centrally-located island that is covered by an expansive piece of Carrera marble. The dark wood floors provides a striking contrast against the crisp, white cabinetry. 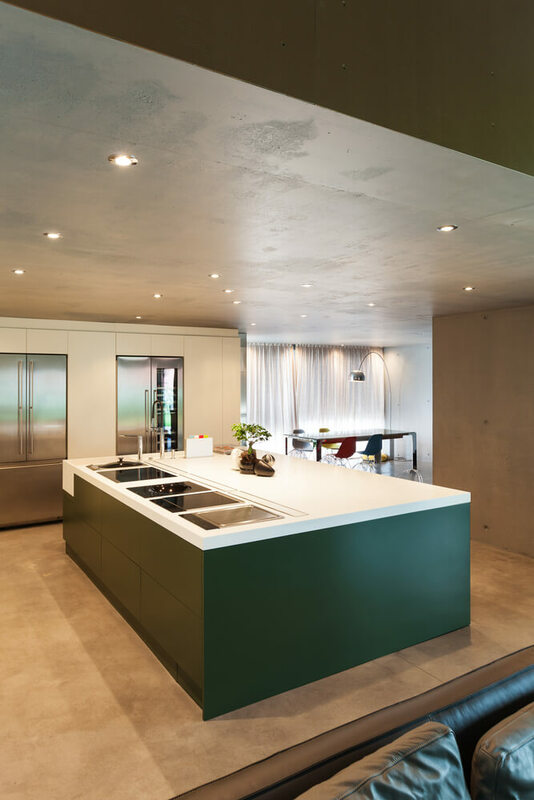 This modern kitchen is designed to accent its concrete surroundings. The island features clean, modern symmetry and multiple built-in appliances. The vibrant green of the island cabinetry fills the simple space with a rich color. 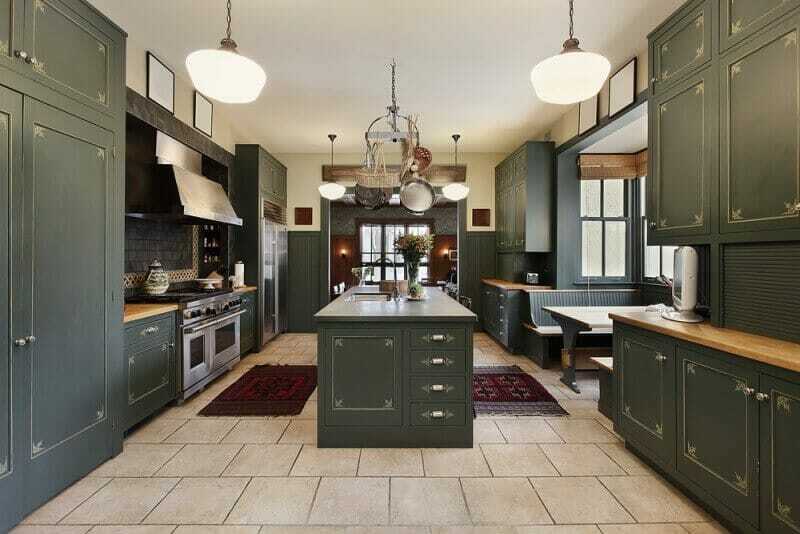 This kitchen is designed to provide all the conveniences of a modern kitchen while reflecting Old World charm. The alcove surrounding the range is accented by custom tile artwork. 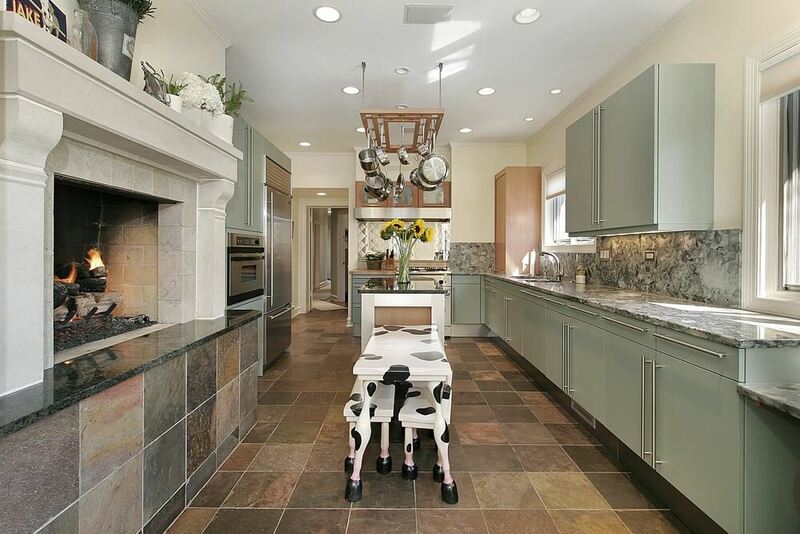 This dream kitchens features two expansive islands. One is designed with a large solid, stone surface and undermount sink. The other features two levels, one for kitchen cleanup and the other acts as a breakfast bar. This modern space features sleek, flat-paneled cabinetry contrasted by a dark grey countertop. The far wall houses built-in appliances and a section of open shelving for cookbooks and dishware. The foundation of this kitchen is the beautiful slate tile floor. Soft green-gray cabinetry constructed with a raised-panel detail provides plenty of storage and counter space. 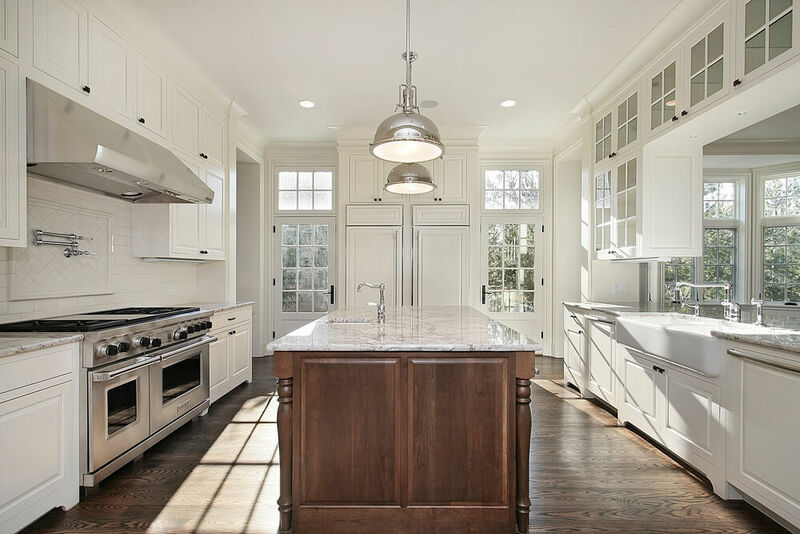 This all-white kitchen features a large alcove that houses a custom range and pot filler. The island is designed to incorporate a breakfast bar and sink. This kitchen is designed with a large row of windows that accent the curvature of the wall. Two islands, one large and one small, ensure that those working in the kitchen do not need to walk far to find a space to work on. 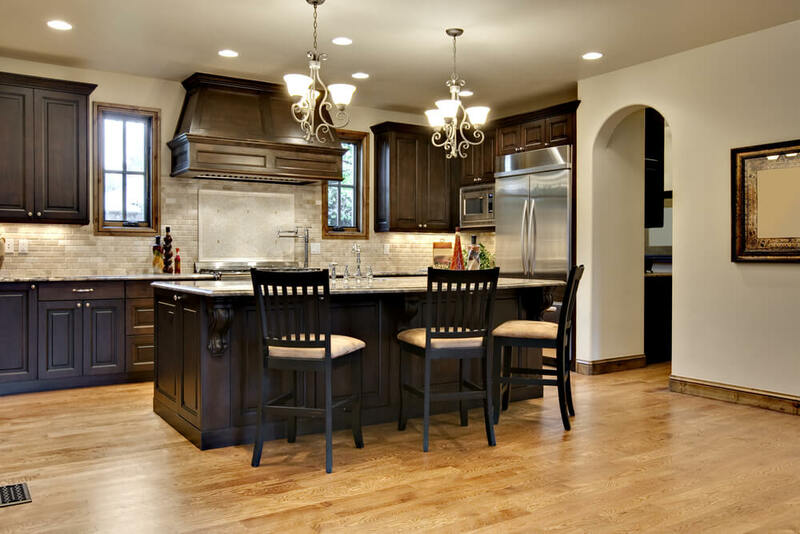 The focal point of this kitchen is the large island, designed with contrasting dark wood. 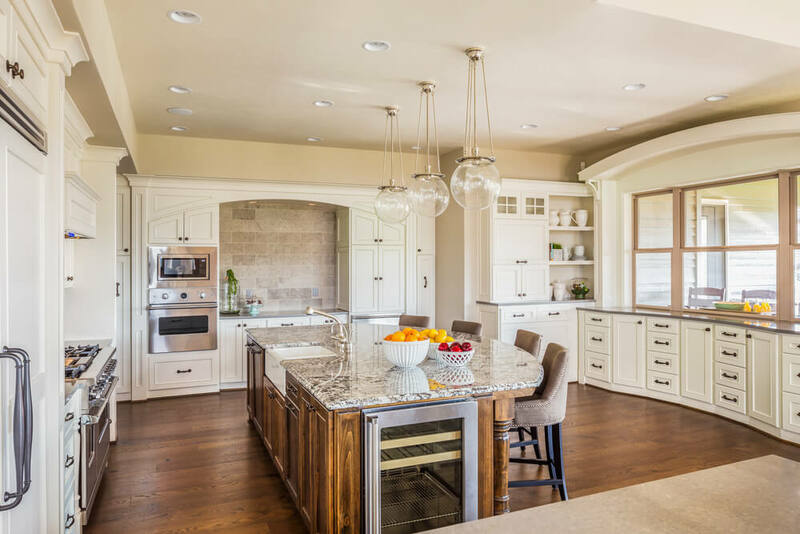 Features such as custom glass doors, a farmhouse sink and multiple sinks make this a dream kitchen. 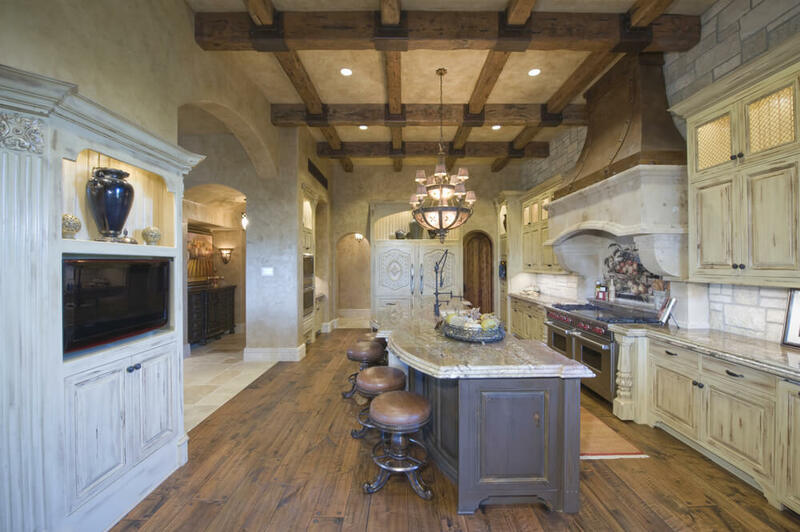 The design of this kitchen accommodates a table for four and an island. 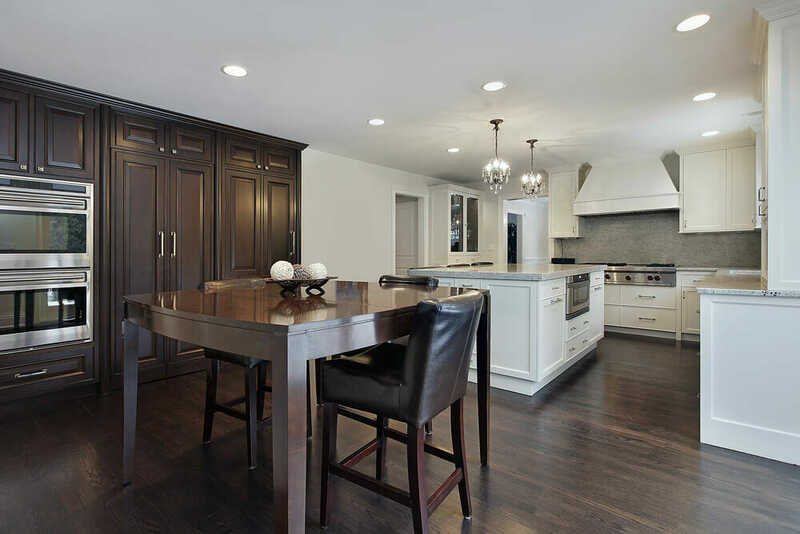 A bank of dark wood cabinetry coordinates with the hardwood flooring and provides a striking contrast against the main part of the kitchen. This kitchen is design with vintage sensibilities. The color of the cabinetry makes this space truly memorable. This kitchen features a unique, horizontal backsplash that varies in color. The island provides space for five to sit comfortably while the meal is being prepared. 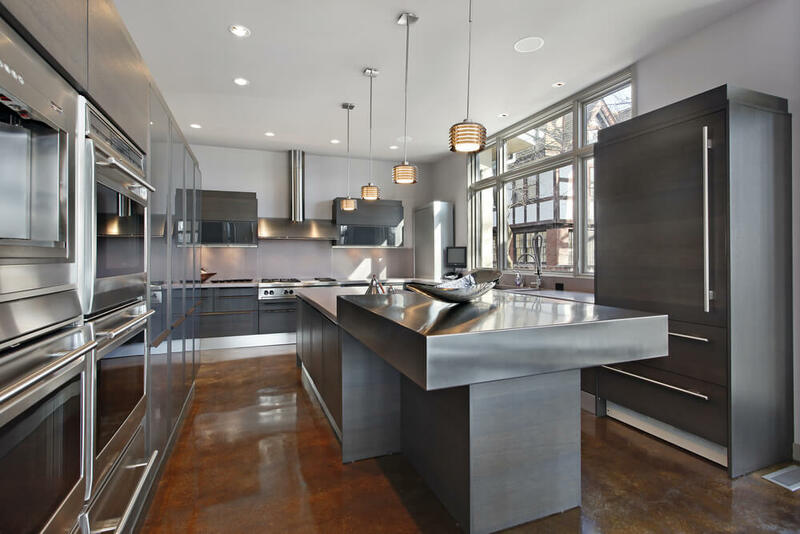 This modern kitchen features industrial, stainless steel countertops and sleek, bar pulls. 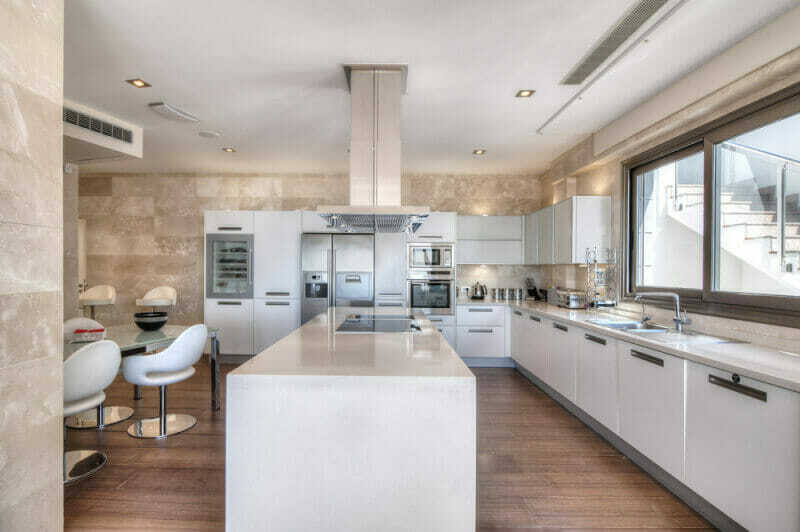 The bi-level island features a breakfast bar and lower area for kitchen preparations. This mod kitchen features white cabinetry and cream countertops. The expanse of lower cabinetry ensure that the space stays light and airy. 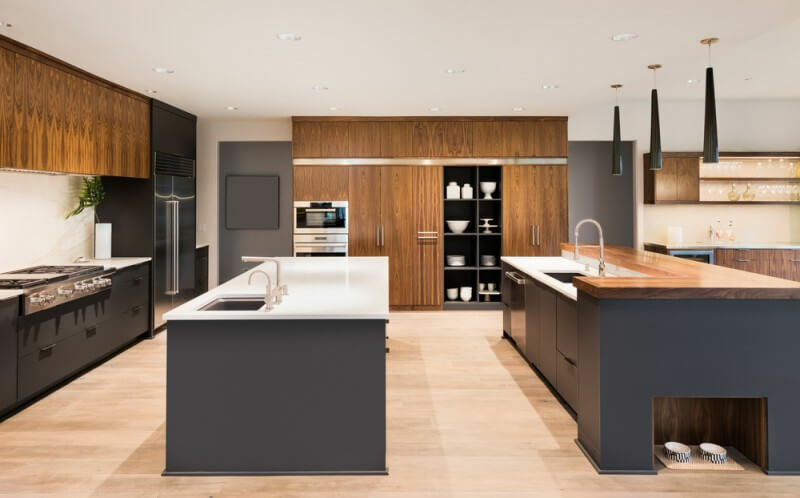 This modern kitchen features a wall of floor-to-ceiling cabinetry accented by a dark gray border. The island is accented by a solid stone countertop installed in a waterfall design. This country kitchen features white cabinetry set against sections of warm wood. A unique, black farmhouse sink and industrial bar stools add an interesting, decorative touch. 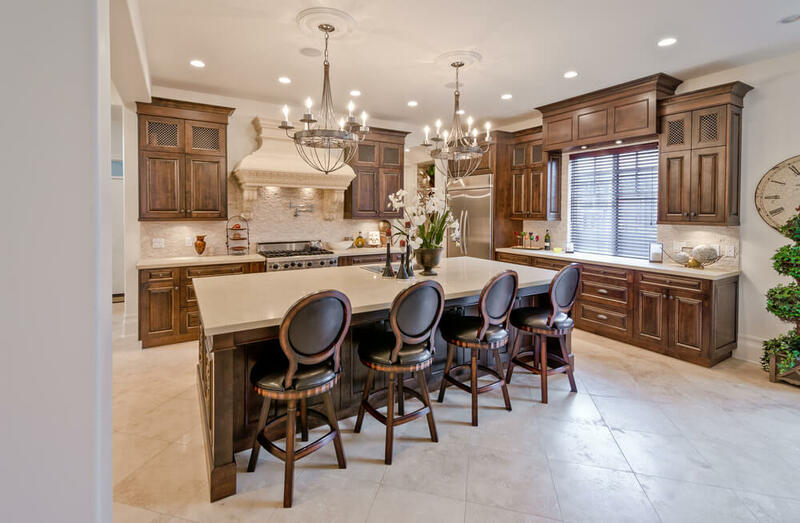 This island features a beautiful, dark wood island/breakfast bar. The cabinetry is accented by granite countertops and gray-toned Subway tile. This kitchen features matching pantries that flank the row of windows. The roomy island and breakfast bar is accented by decorative panels and large columns. This kitchen is designed for a chef. A custom range provides multiple surfaces for food preparation. Opposite the range is a white, farmhouse sink that overlooks the adjoining living area. While it may cover a small footprint, this kitchen features plenty of custom details that make it a dream kitchen. The island features two levels and a large, white farmhouse sink.